Not because they’ll never work out the way you want them to, but because to truly succeed you need to abandon the rigidity of plans. Instead of a plan, think in terms of goals. What are you trying to accomplish? What are your customers trying to accomplish? Instead of a plan, think in terms of strategy. Who are you? Where do you exist? What do you stand for? In a reality where everything is constantly changing, we need to throw aside the concept of plans. They’re too rigid. And when they go off-track (as they inevitably do) we’re stuck floundering, looking for ways to get things back to the way they’re supposed to be rather than accepting them for what they are … and adjusting accordingly. That’s where a combination of goals and strategy fit in. Rather than knowing exactly where you plan to go, instead move forward with a destination in mind, and a variety of ways to get there … and be okay in knowing that you might end up somewhere else. Be vigilant, be aware, and be constantly adapting to your environment. Be proactive and reactive. 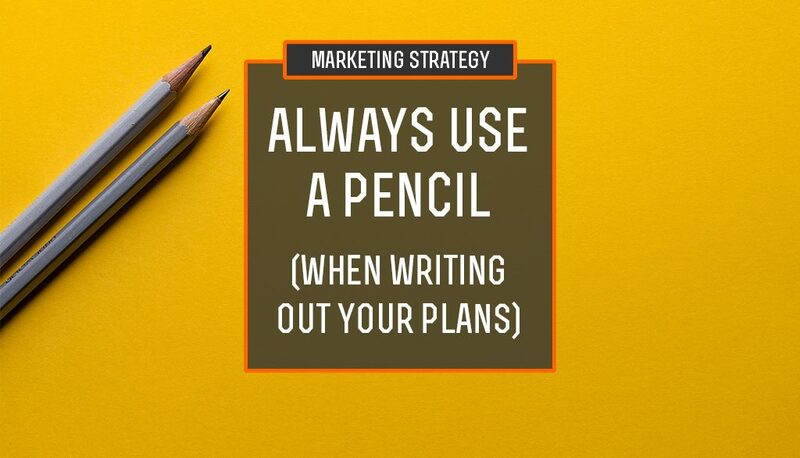 When you get the urge to write out a plan, do it in pencil. Make it erasable, editable and malleable. Allow for it to branch and change and morph. Always with an end in sight (though that end may change as well), and always with an understanding of who you are and the ways you might want to get there. That’s your strategy. That strategy, that combination of all the paths and tools at your disposal (and the new ones you discover along the way), that’s what matters. Understanding how it all works together. Life doesn’t care for your plans. It will not respect them and it has no obligation to follow them. But to be constantly aware, and ever-changing in the face of uncertainties. Being agile in your approach. That’s the road to success (even if success is something other than how you originally imagined it). In my experience in business and life, I’ve learned that there is a difference between apathy and flexibility. And that’s an important lesson for us all to learn. Write your plans in pencil. Cross them out with ink. Be ready to tear out the pages. Throw your notebook in the fire and start again.